The Michener Institute is the only publicly funded academic institution in Canada devoted exclusively to applied health sciences education. Clinical education is an integral component for all Michener programs, and that relies on a vast network of preceptors, or mentors, at busy hospitals and clinics around Ontario. Respiratory Therapy program Clinical Liaison Officer Felita Kwan works with many of these preceptors, and could see the paperwork burden that was limiting their ability to track competency for the students doing clinical placements. That tracking is key to preparing students for graduation expectations. Ms. Kwan’s preceptors were short on time, and the time they did have available was devoted first and foremost to patient care. This meant students were not always receiving performance feedback in a way that was optimized for their success. An in-house online competency tracking tool was developed that met many of the Respiratory Therapy program needs, however, it did not allow for easy reporting. It was still necessary, for example, to maintain a separate spreadsheet on student progress. The Respiratory Therapy program required a secure tool that gathered the same information that had been gathered on paper but customized to an electronic environment. The software had to be flexible for busy preceptors, while supportive of timely and meaningful feedback to students. A flexible and trustworthy tool was required to track competency achievement across three different patient types, numerous clinical sites and ultimately set up students for success. A side benefit would be better support of the accreditation process through accurate, accessible and reliable documentation. The Michener team researched options, including CompTracker®. Through the use of mobile devices and a secure website, CompTracker® enables students, instructors, and administrators to replace the old paper ways of tracking student competencies and achievements for reporting and other processes such as accreditation. CompTracker® is currently used in over 40 post-secondary institutions in Canada, and more than 100 programs. 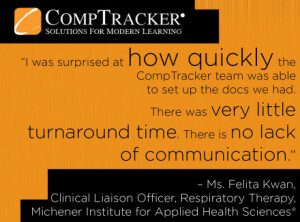 Before making a decision, Ms. Kwan and the Michener team connected with colleagues in Respiratory Therapy already using CompTracker, particularly Fanshawe College as well as the faculty of the Medical Laboratory Technology program at Michener. Upon researching the possibilities, Ms. Kwan and the Respiratory Program team chose CompTracker® for their competency tracking needs. The choice was made easier due to the familiarity of CompTracker to the institution as well as the recommendations and support by CompTracker users in Ms. Kwan’s peer group. Great Big Solutions is looking forward to continuing the journey with the Respiratory Therapy program at The Michener Institute of Education at UHN® as they begin their first semester with CompTracker® September of 2015.